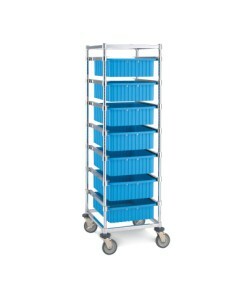 Metro Kitting Carts provide efficient handling of totes. Additionally, they handle PCB carriers, trays, or other miscellaneous material handling containers. Furthermore, they are available in single, double, or triple bay configurations, Metro Kitting Carts come with 2-brake and 2-swivel casters in your choice of resiliant rubber or polyurethane tread. Three sizes, styles to choose. Organizational/Identification: Deluxe tote boxes are accessorized with dividers, to organize box contents, and card holders, to identify box contents. Easy access: tote boxes can be “pulled out” and cantilevered. Flexible usage: deluxe tote box carriers provide organized, high density storage in many functional areas. Easy access: tote boxes can be "pulled out" and cantilevered.